Travelling is exciting, enriching… and (more often than not) expensive. For those of us who love to travel, it is without a doubt that we will want to keep our pre-travelling costs low and are always on the hunt for flight and accommodation deals. 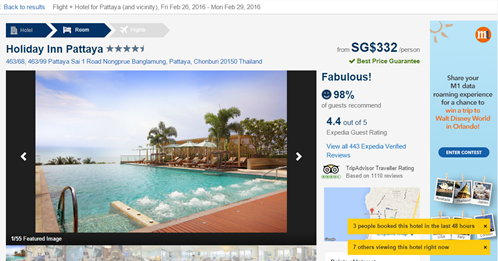 After conducting some research, we decided to book our recent Pattaya trip with Expedia. 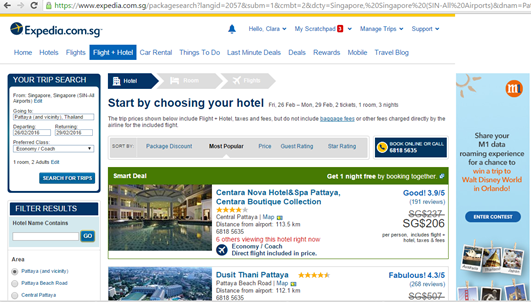 Expedia.com.sg is an online travel booking site featuring the best deals for flights and hotels worldwide. You can choose from over 271,000 hotels worldwide and from 360 airlines such as Singapore Airlines and AirAsia). Booking is made based on availability and the latest offers are constantly updated to ensure that you are paying the lowest possible price. 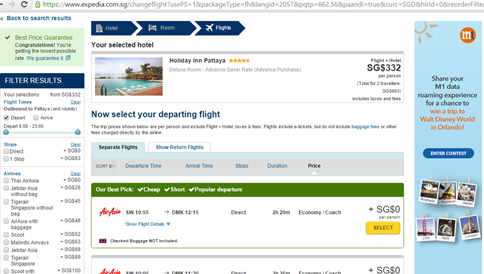 To assure you that you will get the best deals on Expedia.com.sg, Expedia.com.sg promises that if you find a cheaper flight, vacation package, rental car, cruise or activity within 24 hours of booking on Expedia, they will refund the difference* to you. 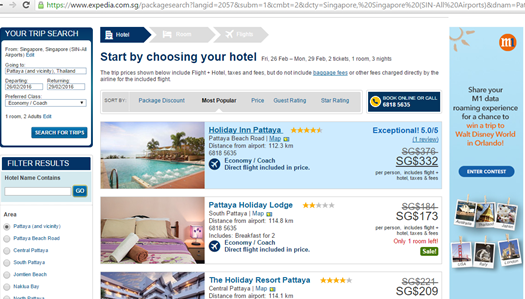 Similarly for hotels, Expedia.com.sg also promises the same thing if you find a cheaper rate of your hotel reservation up to two days before your check-in! *Read the full terms and conditions of Expedia’s price guarantee here. 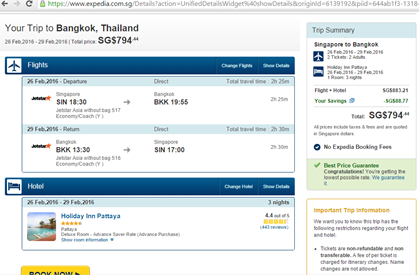 Booking our Pattaya trip was easy and convenient with Expedia’s Flight + Hotel Booking option. Psst, did you know that you can have savings of up to 31% when you book your Flight + Hotel together? Expedia consolidated all the different flights flying to Bangkok (Pattaya doesn’t have its own airport, so we will be landing in Bangkok and will be taking an airport transfer to Holiday Inn Pattaya), which meant that we could compare the prices and flight timings of all the flights to Bangkok much more conveniently instead of comparing from the different airlines’ websites. Why book your Flight + Hotel together? Here’s why! Click here to enter your flight details then press Search. When you choose the Flight + Hotel package option on Expedia, you will first start by choosing your hotel at your destination. From the whole range of accommodations available on Expedia (you will be spoilt for choice, trust me), you can choose to filter or rank the list of hotels according to Package Discount, Most Popular, Price, Guest Rating or Star Rating depending on your preference. You can check out each hotel before making your choice. Photos, reviews, hotel location and facilities are all listed transparently to help you make your final decision. Once you have decided on your desired accommodation, select it by clicking on it. Of course, I will highly recommend choosing a “Smart Deal”. What is a “Smart Deal”? When you choose to book your Flight + Hotel together, you might be able to get a flight or hotel for free! These deals will be featured as a “Smart Deal” as per the screenshot below. Alternatively, if you already have a hotel in mind, you can search for the hotel using the search bar on the left sidebar. Upon selecting your choice of hotel, the availability of each type of room would be presented to you. You can choose to top-up an additional amount if you wish to opt for a bigger room or a suite. We stayed at Holiday Inn Pattaya, so do keep a lookout for our next article where we will be reviewing Holiday Inn Pattaya! Now that you’ve settled your accommodation, it’s time to select your return flight from the list of available flights. Lastly, you will then receive a breakdown of the total costs for your booking and trip itinerary, where you’ll be able to view how much you’ve saved by booking through Expedia. In our case, we saved S$88.77, which was 10% of our total cost. If you wish to confirm your booking, click BOOK NOW. But if you are still not entirely sure, there’s an option to Save this itinerary, so that you can keep a copy of your selected plans so far before you confirm your booking. 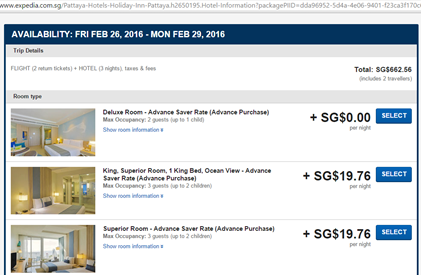 All in all, we managed to book our return flight for 2 pax and 3 nights of accommodation at Holiday Inn Pattaya for slightly less than S$800! Expedia+ is a rewards programme exclusive to Expedia members and is tiered according to plus blue (free, the moment you create an account), plus silver (after S$5,000 on eligible bookings or 7 qualifying hotel room nights) and plus gold (after S$10,000 on eligible bookings or 15 qualifying hotel room nights). This rewards program offers many advantages from vouchers and points that you can redeem to enjoy travel perks like priority customer service, exclusive travel offers and even room upgrades! To see the full extent of your benefits, click here. As this is the ‘season’ of travel fairs, I’m sure many of you are on the hunt for the best travel offers and deals, especially if you’re looking make use of the 5 remaining long weekends in 2016. From now till 13th March 2016, Expedia is having an Expedia Online Travel Fair, which offers the most value-for-money packages just simply a click away! Now, you can ‘shop’ for your flights and hotels in the comfort of your home, without having to squeeze through crowds and stand around till your legs are sore. The Expedia Online Travel Fair will be open for bookings with over 30 destinations to choose from, as long as your period of travel falls within now to 30th June 2016. 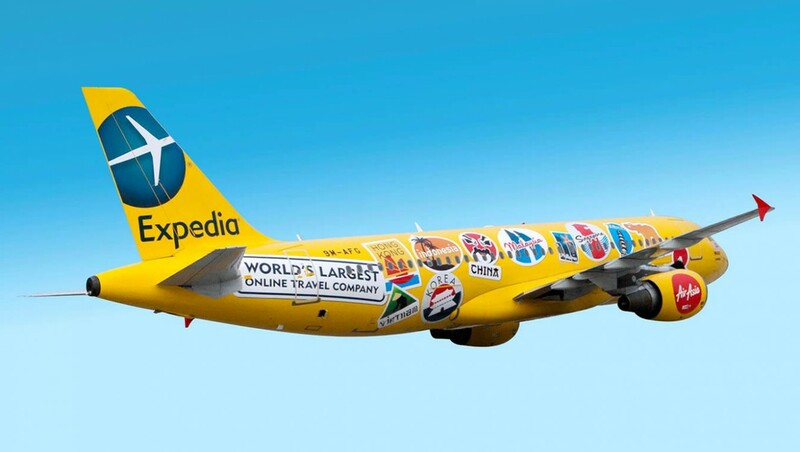 With all the benefits and travel deals and offers on Expedia, we hope that you can now go easy on your wallet (like us!) and travel more freely. If you want to be kept in the loop of Expedia’s offers, deals and contests (which they always update), you can follow them on Instagram – @ExpediaSG. You might be the winner of the next free trip they are offering! Remember to stay tuned for our Holiday Inn Pattaya review coming up up next! This post is brought to you by Expedia.com.sg.